The dates will be confirmed after the elections to the European Parliament in May 2019.
their overall coherence and the role of parliamentary scrutiny. 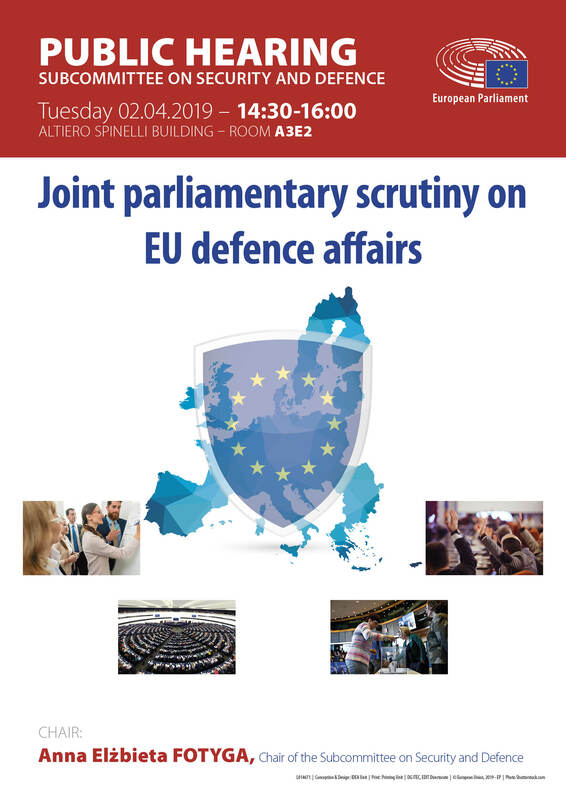 It is necessary to analyse the role of the European Parliament and national parliaments in relation to the scrutiny of the European Defence Fund. There is a need for recommendations on how parliamentary scrutiny can be enhanced at the EU level in the area of security and defence. Tá ár síocháin agus ár sábháilteacht, nithe nár cheart talamh slán a dhéanamh díobh riamh, faoi bhagairt arís is arís eile ag imeachtaí atá ag tarlú ar ár dtairseach agus níos faide i gcéin. Leagtar amach sa Chonradh ar an Aontas Eorpach an bunús dlithiúil atá ag Ballstáit chun beart éifeachtach a dhéanamh chun aghaidh a thabhairt ar na bagairtí seo i gcomharsanacht AE. Le bunú an Chomhbheartais Slándála agus Cosanta (CBSC) sa bhliain 1999 agus leis an 30 misean sibhialtach agus míleata a rinneadh ó shin i leith, tá AE tar éis cur le cobhsaíocht agus cabhrú le síocháin a choimeád sna Balcáin, i gCugas Theas, san Afraic agus sa Mheánoirthear. Sa bhliain 2013 leag ceannairí AE treochlár amach chun go mbeadh acmhainní níos éifeachtaí agus spreagadh nua ag CBSC, agus ag an am céanna leagadh béim ar an gcaidreamh tábhachtach atá againn le ECAT. Tá an Fochoiste um Shlándáil agus um Chosaint (SEDE) tar éis é féin a chur chun tosaigh mar phríomhfhóram chun díospóireacht a spreagadh agus chun scrúdú a dhéanamh ar dhul chun cinn CBSC ó thaobh institiúidí, acmhainní agus oibríochtaí de. Is uirlis fhíor-riachtanach í chun cinnteoirí CBSC a thabhairt chun cuntasachta agus chun go mbeadh an beartas intuigthe do shaoránaigh AE. San 8ú téarma parlaiminteach seo, leanfaidh SEDE de ghrinnscrúdú a dhéanamh ar an CBSC chun a chinntiú go dtugann sé freagairt thapa agus éifeachtach ar na dúshláin nua agus na dúshláin atá ann cheana a mhéid a bhaineann le sábháilteacht an Aontais agus a chuid saoránach.